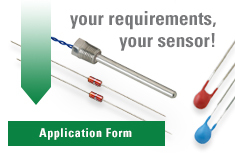 While measuring a thermistor, care must be taken so as not to heat it up. Zero Power Resistance, a measurement of the thermistors’ resistance without significant self-heating, is the desirable method of determining the temperature of a thermistor, however, not all applications require low power dissipation. Some applications, gas flow measurement and liquid level sensing for example, depend upon the thermistor to self heat during the application. Therefore, it is necessary to know how much power is needed to dissipate in the thermistor to obtain the desired results.